Here is a day per page planner I bought while I was living in Moscow. That year I was using a different day per page planner that I really loved, so this one didn't get much real use. What I did use it for, which it was great for, was communication. As you can see from the photo (which you can click on to make larger), the days and months are written in English and Russian. This helped me learn my days and months, and was extremely useful to communicate with my language instructor and anyone else exactly what day we were to meet. Both of our languages were there on the page, and I wrote the appointment directly onto the page at the appropriate time, so there was no confusion whatsoever of when we were scheduled to meet. It seemed like the majority of people I knew in Russia used a day per page planner, and they used it for everything: not only planning but also meeting notes, random jottings, sketches, etc. I've been fascinated with how people use their day per page books ever since my sister's Textagenda. Another feature of this planner that I really like are the types of information at the beginn ing of the book. I like to buy a planner in the country I'm living in at the time, for the country information. 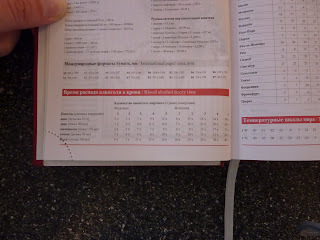 This planner is full of useful info that I wouldn't otherwise know such as calling codes for all of Russia, car license plate codes, lists of Russian holidays. And perhaps most interesting, there is a chart of blood alcohol decay time. Russia has a zero-tolerance drunk driving policy. So this little chart tells you how long you have to wait until you are legal to drive. Brilliant! That is so cool! Russia is at the top of the list of places to see before I die. I love that planner. I clicked on the link but it took me to a vodka website. I followed you here from Philofaxy, love your posts. Yes the link takes you to Russian Standard Vodka (my little joke tie-in with the title and the alcohol-decay chart at the bottom of the post ;D ). If you click directly on the photos themselves, you can see an enlarged photo. Wow I am such a huge dork! DUH! That's hilarious Laurie, you made me chuckle this morning. No easy feat after driving in snow and ice for nearly two hours and still having to head back home! I just got my accessory package in from Filofax and am really disappointed :0( I came from a cheap DayOne Franklin Covey binder. 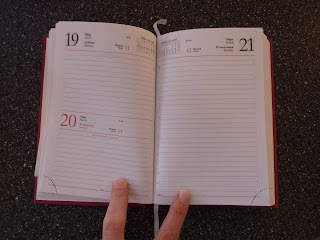 I really liked the tabbed month at a glance on two pages and then the weekly format afer. The week was horizontal (M,T,W on the left, Th, Fri, Sat, Sun on the right) and split for appointments and to do. Really disappointed, not sure how I am going to hack this to get it to fit since I have a personal size and it is a pain to print your own inserts. I love how narrow and lighter my Filo is from the FranklinCovey planner, much easier to fit in my purse but am not happy with the recent discovery. Hi Amanda, sorry to hear about your inserts, that is extremely disappointing!! I hate it when something I've ordered turns out to be not the way I expected. And yes, that does get very expensive when I get "mistakes" that I can't use. Hopefully somebody here or over at Philofaxy will have some advice for you! Try the Day Runner Poetica weekly refill. They have the monthly tabs you need included and at a very reasonable cost.